Karate classes are offered for ages 4 years through adult though the Illinois Shotokan Karate Club. 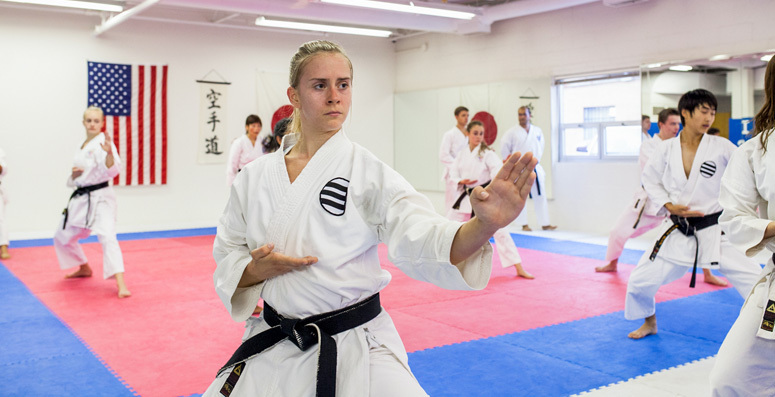 All classes are taught under the instruction of John DiPasquale, a four-time National Champion, US National Coach and President of the US National Karate Federation. • All classes are held at the Sullivan Community Center. • Uniforms and Belt-Testing are options available through the ISKC instructor. • Please note that the Youth, Parent/Child and Adult classes may train together. • Beginner students will not be permitted to register into the current session after the second class has met. • Registration for continuing students through advanced students will be accepted after the start date, but the full class fee is required. • Please visit www.ISKC.com for more information or call 847/359-0666. In our Pre- Karate classes, young children develop flexibility, strength, and coordination in fun, yet disciplined activities. This program is specifically designed for growing minds and bodies to enhance memory and agility. Watch your child’s confidence blossom and their skills improve. Parent/Child classes are a great way to spend quality time with your child, while conditioning muscles, developing coordination and improving cardiovascular fitness. ISKC’s Youth karate classes will put children in touch with their bodies and offers a good mix of strength training, with cardiovascular and flexibility exercises. Children increase their coordination, agility and poise, as well as learn lasting personal safety skills. They also benefit from the mental stimulation of learning the choreographed moves of the kata and the discipline of conforming to the class rules. Our Adult classes release tension, develop total body fitness and build stamina and overall productivity! In addition to self-defense skills, karate increases flexibility, cardiovascular endurance, and muscle tone, while improving core strength.